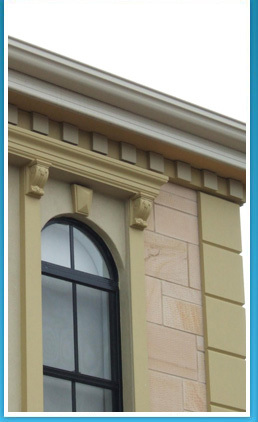 Our moulding technology has been used in Australia since 1985, therefore you are assured of time proven performance. The mouldings will not rot, surface craze, warp or lift once installed. Our products are crafted on tight tolerance EPS foam cores to insure perfect, repetitive alignment over long installation details. The products great strength and superior quality is produced by our exclusive coating system, which consists of reinforced mesh and acrylic polymer cement surface skin. This also gives that durable masonry appearance. Our manufacturing process incorporates the use of Dulux Exsulite, to produce tough durable products that are unaffected by ultra violet radiation, rain, or harsh environments. Being strong and lightweight they are easy to handle and fast to install, making them very cost effective.